Incendiary kites presented by official Hamas newspaper as a "peaceful means of resistance." The Hamas-affiliated newspaper Felesteen published an article on the incendiary kites that are being launched by terrorists from the Gaza Strip into Israeli territory and the extensive damage they cause due to large-scale fires that ensue. The headline of the article, featuring a photo of agricultural land burning in Israel, was: "The Firebomb Kites - A Means of Peaceful Resistance that Embarrasses Israel." Saleh Lutfi, an expert on Israeli affairs, was quoted as saying in an interview with the newspaper that Israeli society is "embarrassed" by what he called "the new means of peaceful resistance in addition to the procession of the return which is expressed in the launching of the firebomb kites which cause direct material damage to the agricultural sector in the area surrounding the Gaza Strip." 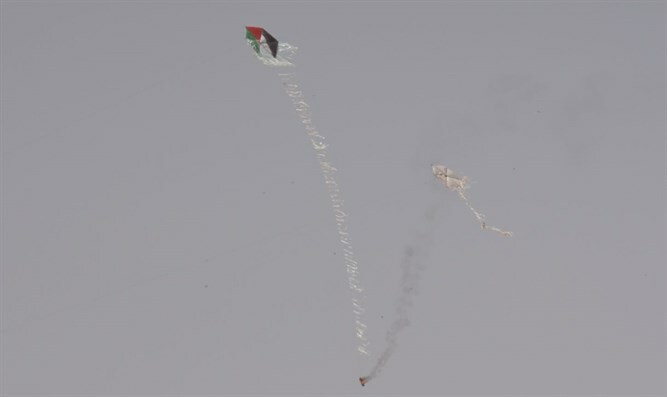 According to the report, Lutfi, who heads a research center based in Umm al-Fahm, said that the firebomb kites are not only a "peaceful Palestinian renewal," but are causing Israel to pay a heavy price, expressed in economic damage estimated at millions of shekels. In recent weeks, terrorists have launched balloons and kites rigged with improvised explosive or incendiary devices, sending them into Israeli territory. Millions of shekels of property, including farm lands near the border, have been destroyed in the attacks.